Beginning with their first Profundo Rosso Goblin were obviously better suited to soundtrack music than as a studio offering and the majority of their work was in this vein. One of the exceptions, their excellent second Roller is a great blend of symphonic progressive and horror-movie themes best on the lengthy track "Goblin." Their best soundtrack Suspiria was also a good movie and may be the best one to start with mixing a variety of effects into a progressive whole - interesting music. Later efforts, although I haven't heard their rare and unreissued 4th Il Fantastico Viaggio Del Bagarozzo Mark were rather average including the soundtracks Zombi and Dawn Of The Dead. Most of their works are short however, rarely going over 30 minutes. Italian band from the 70s/80s that did mostly (or maybe only) soundtracks for grade-B horror movies. Most of their stuff is really heavy and moody, with a Floydian progressive feel, and generally pretty good. All are fairly short albums (like 25-30 min.) and most of the CDs are all pricey japanese imports. They are famous for the soundtrack of the Dario Argento's films. They sound like an experimental, vangard band where only the lp Il Fantastico Viaggio Del Bagarozzo Mark and the last two albums are not instrumental. 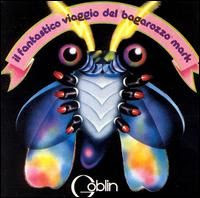 Goblin were a very prolific band from Italy, who injected much of the "progressive" idiom into their music, most of which was in the form of horror movie soundtracks. Il Fantastico Viaggio Del Bagarozzo Mark was not, though, but showcases their aggressive guitar/drums/keyboard style very well. Their compositional style was quite unique, combining diminished chord textures with processed vocals, and from passages on this CD, this "horror movie style" can be felt. This, recorded in 1977, along with Roller and Suspiria are probably the "essential" Goblin works. Tenebrae is another somewhat obscure soundtrack by the kings of the Italian horror movie score team, with a large variety of the darker style of music that has always made its way into their more accessible prog rock releases.